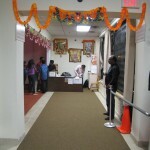 The Shirdi Sai Mandir, the Shirdi of North America, is conveniently located at 2721 Markham Road in Toronto, ON just north of Finch Road and Markham Road. 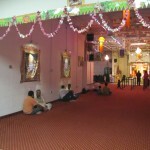 Baba’s Mandir is spread across 4 units (6,7, 8 and 9) with a total area of approximately 8,000 square feet. 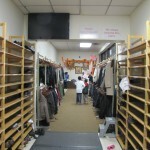 The entrance to the Mandir is from Unit 6 which leads into the reception area with facilities to place footwear and jackets. Rest rooms have been provided by the reception area. 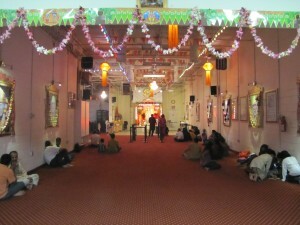 After walking across unit 7, further into the reception area, devotees enter unit 8, which is the main darshan and meditation hall. 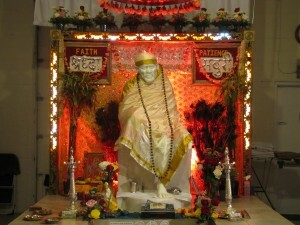 Baba’s beautiful marble murthy, facing west, is located in the East end. Baba’s benign look and mystical smile welcomes everybody to His Dwarkamai in Toronto. 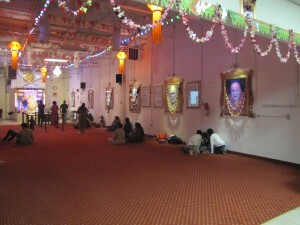 This is one of the very few Mandir’s wherein devotees can touch Baba’s murthy to seek blessings and energy. Devotees are requested to ensure that ornaments such as rings and bangles do not scratch Baba. 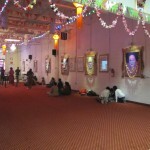 Devotees can see a beautiful picture of Baba’s murthy in Shirdi mounted on the wall behind Baba’s murthy. This picture was placed on the altar before Baba’s murthy pratistha. 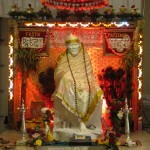 Devotees may offer parikrama to Baba around the altar. We request devotees to refrain from conducting parikrama during Aarti and pujas. Parikrama may not be possible on busy days such as Thursdays and major events. 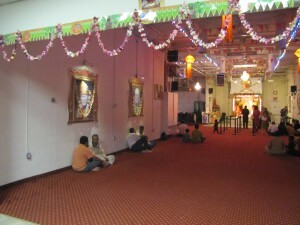 Unit 9, on Baba’s left, houses a stage for Bhajan singers. A seating area is available in Unit 7 for seniors. 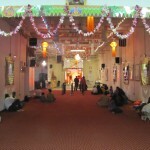 The Prasadalay, (food distribution) is located in Unit 6 and can seat upto 150 devotees. A small kitchen is located in the west corner of unit 6. The resource centre is located in the western corner of the reception area in Unit 9 wherein various articles such as Satcharita (in various languages), CDs, books can be acquired by devotees for nominal donations. 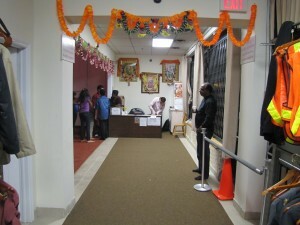 Devotees using wheelchairs may enter the Mandir using bay doors of unit 7 from behind the Mandir. 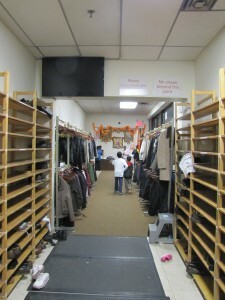 Please call 647-444-4724 and request a volunteers assistance in opening the bay doors.